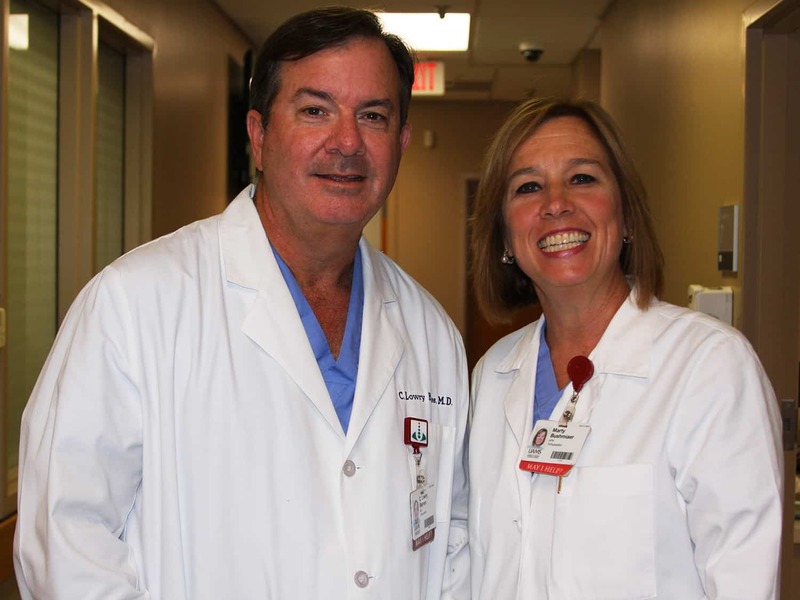 C. Lowry Barnes (left), M.D., chair of the UAMS College of Medicine’s Department of Orthopaedic Surgery, with Marty Bushmiaer, A.P.R.N., his longtime nurse. Aug. 23, 2017 | Aug. 23, 2017 | C. Lowry Barnes, M.D., has made a distinguished career as an orthopaedic surgeon with the support of a kindly mentor and a dedicated nurse. Now, he’s paying it forward: spreading $75,000 across two scholarships, each honoring their contributions. Barnes donated $37,500, matched by UAMS for a total of $75,000, towards the Blackwell-Barnes College of Medicine Scholarship and the Marty Bushmiaer Orthopaedic Nursing Scholarship. The former honors his mentor, Banks Blackwell, M.D., and the latter honors Marty Bushmiaer, A.P.R.N., Barnes’ longtime nurse. The Blackwell-Barnes College of Medicine Scholarship will assist College of Medicine students with a preference for those from southeast Arkansas and an interest in orthopaedics. Barnes, who has served as chair of the Department of Orthopaedic Surgery since 2014, was invested June 1 in the Carl L. Nelson, M.D., Distinguished Chair in Orthopaedic Surgery. He is one of Arkansas’ and the region’s foremost joint replacement experts. Barnes credits his interest in orthopaedics to Blackwell, a fellow Pine Bluff native, who mentored him at Jefferson Regional Medical Center. “Banks was an orthopaedic surgeon, and his support helped me become one,” Barnes said. Barnes, who graduated with honors from the College of Medicine in 1986 and completed his internship and residency in orthopaedic surgery at UAMS, was one of many students whom Blackwell helped send to medical school. The Marty Bushmiaer Orthopaedic Nursing Scholarship will support orthopaedic nurses in obtaining an advanced nursing degree from the College of Nursing. Bushmiaer has worked alongside Barnes since 1994, when she was pursuing an advanced degree at UAMS. They collaborated on project at Arkansas Children’s Hospital while she was in graduate school “and the rest is history,” Bushmiaer said. The path to becoming a nurse was always clear in her mind, Bushmiaer said. Bushmiaer looks forward to introducing more nurses to the specialty.